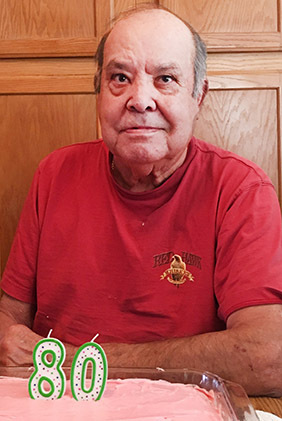 A rosary and memorial service are scheduled for 1 p.m. Saturday, Jan. 19, at Funeraria Del Angel South Lawn, 5401 S. Park Ave., Tucson, Ariz., for Tomas Carrasco Dominguez Jr.
Dominguez, 80, passed away Thursday, Jan. 3, 2019, in his family’s loving hands. A gathering will precede the services at 12:30 p.m. at Funeraria Del Angel South Lawn. Interment will be held at 2 p.m. in the Vets Island section, Row 64, Lot B, Space 12). A reception will follow. Tomas was born Feb. 4, 1938, in Ft. Stockton, Texas, to Tomas and Maria Dominguez. He was a beloved grandpa, father, brother and husband, and a retired auto body mechanic. Survivors include his wife of 62 years, Bel; daughters Rosemary Rascon and Grace Carrasco and husband Armando; son James Dominguez; brothers Joe and wife Gloria, John and wife Mary, Eddy and wife Laura, and Danny; sisters Lee Guerrero and husband Felipe, Socorro Madrid, Kathy Ramirez and husband Adam, Stella Hernandez and husband Rick, Olga Rivera and husband Johnny, Rosella Johnson and husband Jack, Pat Gamez and husband Lupe, and Mary Helen Alaniz and husband Danny; granddaughters Gina, Shannon, Angelica, Stephanie, Jessica, Kimberly, Sabrina, Kathryn, Kayla, Gillian and Savannah; 18 great-grandchildren; five great-great-grandchildren; and several nephews, nieces, cousins and friends. 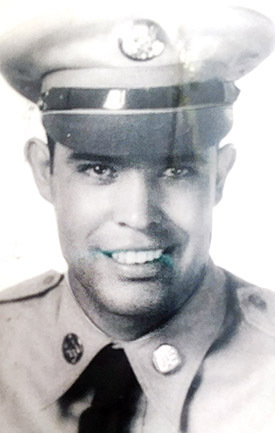 He was preceded in death by his parents; son Jerry Dominguez; and brother Robert Dominguez.